The collapse was caused by what authorities said was a gas explosion. 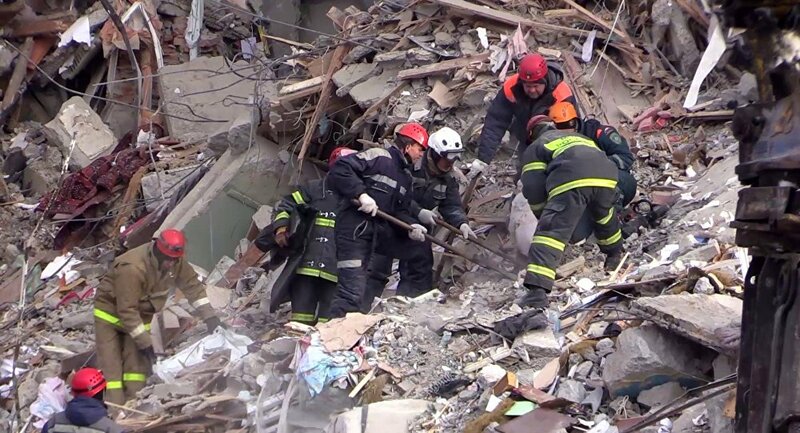 The Russian investigative committee has said that no traces of explosives were found during the search at the collapse site. Alexander Chupriyan, the Russian deputy minister of civil defense, emergencies and disaster relief, said on Thursday that search and rescue teams had been working at the incident site four days. "About 2,000 cubic meters of building elements have been removed from the debris. We have been [working] here for four days," Chupriyan told reporters. The Russian Health Ministry's regional department said in a statement on Thursday that all the injured who had been hospitalized following the collapse were in a stable condition. Chupriyan confirmed on Friday that the bodies of all 39 victims had been identified. Some 200 volunteers provide assistance to affected people. The damaged residential building would be split into two separate buildings, Dmitry Fedechkin, the press secretary of the governor of Russia's Chelyabinsk Region, told Sputnik. "It is planned to split this apartment building in Magnitogorsk into two parts, two separate buildings. The seventh section has been destroyed, and it used to be located over an arch, which makes it possible [to split the building in two]," Fedechkin said, adding that experts had conducted a visual and a technical inspection of the building and had established that sections 1-5 and 9-12 were safe for living. Magnitogorsk mayor Sergei Berdnikov said on Thursday that the entrance to the evacuated section of the building was being guarded by armed police units 24 hours a day to prevent looting in the collapsed apartment block. The press service of the Chelyabinsk Region's governor said that more than 20 people affected by the tragedy had received payments on Thursday totaling 5.2 million rubles ($76,307). READ MORE: Bodies of 22 Magnitogorsk Blast Victims Identified — Russian Emergencies Min. Moreover, due to the loss of property, 500,000 rubles will be provided to each family who lived in three-room apartments, 400,000 rubles to the families who lived in two-room apartments, and 300,000 rubles to the families who used to live in one-room apartments. The government of the Chelyabinsk Region will pay 1 million rubles to individuals who lost their family members as a result of the incident, 400,000 rubles to those who received grave or moderate injuries, and 200,000 rubles to the people who got minor injuries. Magnitogorsk Iron and Steel Works (MKK) announced on Friday its intention to send about 100 million rubles to the tragedy victims. Berdnikov said that Magnitogorsk authorities had called on all local gas companies to carry out additional checks throughout the city. Multiple foreign leaders and diplomats, including UK ambassador to Russia Laurie Bristow, Iraqi Ambassador to Russia Haidar Mansour Hadi, the Syrian Foreign Ministry, German Foreign Minister Heiko Maas, the presidents of Armenia and Belarus, Armen Sarkissian and Alexander Lukashenko, and the European Union have extended their condolences over the incident. Patriarch of Moscow and All Russia Kirill on Thursday held a memorial prayer for the victims in the Dormition Cathedral of the Moscow Kremlin.